The first two sections of this wiki describe the Program Locator and our use of maps. We need volunteers, staff and sponsors to keep developing the technology, continue to deepen our understanding of tutor/mentor programs in the Chicago region and create on-going advertising that draw more people to this information. a) a link to a donation feature where people can raise money for one or many of the programs shown on the map. Our goal is to increase the flow of volunteers and donors, with people using the map to choose where to give heir support. This section of Links Library includes links to crowdfunding sites that we should look at prior to building this feature into our site. This is a presentation showing the type of crowd funding platform I'd like to build. c) information tables feature - if we can create pop-up tables that show youth population in a zip code or community area along with number of youth in existing tutor/mentor programs, or just number of existing programs by age level, this could be used by donors and program grant writers to make a consistent case for where programs are needed. d) There are growing examples of others creating platforms that show indicators of need in a community. A few, like the Boston Indicators Project and Boston Foundation are creating giving platforms that align with areas of need. The benefit of this is described in this blog article. Here's a 2016 article that talks about collaborative funding. If we can build a platform that incorporates such features, and can fund it with third party investment, we can make the code freely available to be used by many leaders, in many sectors, and many cities. This would provide hundreds of entry points in any community for volunteers and donors to find tutor/mentor programs and places to engage and learn how to support the growth and constant improvement of such progams. Use of Asset Maps Section of Program Locator. Since not all programs are good at marketing their services, we need to create affinity groups within businesses, churches, hospitals, colleges, etc. 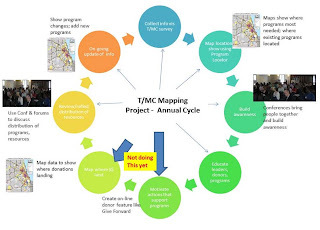 who are using the maps to build their own understanding of where tutor/mentor programs are needed, in order to develop communications programs that attract members of their own networks to be volunteers, leaders, donors in programs near where the business, college and/or church is located. Thus, the a a section titled ASSET MAPS, shows faith groups, colleges, hospitals, businesses, etc. Within each category, or layer, are sub levels. Thus the faith group category has nine layers, with info showing Catholic, Methodist, Lutheran, Baptist, Presbyterian, Christian, Jewish, Muslim, etc. denominations. We have a category for banks, with seven different banks shown, and a category for insurance companies, and pharmacies. Ultimately, we plan to divide assets into 16 career clusters (finance, communications, technology, hospitality, etc.) and create sub layers that would show different institutions within each category. If your company can sponsor such a category, this will speed development of this information. In addition, the new Program Locator has a "GOVERNMENT MAP" section in which we provide three categories of information. These are Illinois Congressional districts, State Legislative Districts, and State Senate districts. Thus, visitors can create a map showing a specific legislative district, the need for tutor/mentor programs in that district, the existing programs, and ASSETS that are located in the district who could be providing support to existing, or new, programs located in the district. If we can build these features into the sites we can accomplish several parallel goals. g) we create more opportunities to lease our map/program locator to other cities. As we get more users in business, politics, religion, etc. , they can begin to learn from each other, and compete with each other to see who can do the most good. We will add sections for Chicago Aldermanic Wards, and Cook County Commissioners when we have the funds to do this . Anyone who wants to improve the skill level of the workforce, or improve social justice, is a potential user of this resource. As long as the Tutor/Mentor Connection maintains one of the best databases of volunteer-based tutor/mentor programs in the Chicago region, with the level of detail that we provide, we will be a hub that anyone else might use to make decisions of where and how they become involved in helping inner-city kids have brighter futures. If we provide easy to use tools to support the decision making of people who might become volunteers or donors or who might write about this in media, we will attract a growing number of users, and they will become advocates, who constantly expand the number of people using this system to help kids. Without support from a consistent base of donors it will not be possible to keep this service available to the Chicago region. Email ten.knilhtrae|2rotnemrotut#ten.knilhtrae|2rotnemrotut if you would like to be a sponsor, partner, volunteer or donor to support this resource.